In any engineering application, from aircrafts to solar panels, the process to achieve a final product is long and complex, and it might be hard for an outsider to grasp all the hard work that needs to be done to even to take the simplest decisions. Throughout the years, many methodologies have been proposed to take such decisions based on certain requirements/parameters, and here I am merely showing you one. One of the most important decisions to take at the start of our project was the smartphone model. Think about all the possible implications that such a choice will have throughout the entire project: it will affect what we can measure, the quality of our pictures and videos, the simplicity of modifying the software, the layout of the satellite interiors, and much more. So how do we take such an important decision? The first step is to define the parameters that will affect the choice of our smartphone: dimensions, processing power, battery life and so on. When the list is complete, we can set up what is called a “Binary Matrix”. In a “Binary Matrix” we compare all the parameters with each other, giving scores of 1 or 0 based on what we consider more important for the design. Is it better to have a phone with a higher pixel density camera, or a longer battery life? In this case, the choices were taken according to the primary design requirements, which are derived from the mission objectives. The mission objectives, in simple words, define what the overall mission is supposed to achieve. In our case, they consist of designing a fully operating cubesat according to standards, capable of operating in the higher atmosphere, taking measurements and communicating with the ground, and capable of short-range communication by wi-fi with other cubesats in the possibility of a formation flight. Mission objectives are also divided into primary and secondary, separating what is considered vital for the success of the mission from the rest. The primary design requirements selected were operating system, dimensions/modularity, gps and camera. It is very important for the operating system to be open source and have a wide availability on the market, so the choice was to look into Android smartphones. Another very important requirement to be considered is the dimensions and the modularity. The cubesat limits are clearly defined to be 10cm per dimension, so anything bigger than that would require positioning the motherboard in weird diagonal positions, or could simply be too big to fit at all. Gps antenna is also fundamental, since it is the only reliable way to trace its location and altitude, while the camera is the most important payload. This same reasoning goes into each parameter, and finally the Binary Matrix is completed. It is important to add one to each value, so that even the lowest scoring possible value will have some weighting, even if minimal. The second step of the process is to collect all the smartphones data, to finally compare them with one another and find the desired output. Since this is a budget limited project, price plays a too much important factor and it is considered separately at a later stage. Once all the data is collected in one datasheet, we need to define a scoring system. This system has to be designed so that both quantitative and qualitative parameters can be weighted accordingly. Each smartphone was given a score of 9 if it excelled in the related category, a score of 3 for a medium performance, and a score of 1 for a poor one. For quantitative parameters, the range was divided into three sub-ranges. For example, smartphones with a 5MP camera or lower were given scores of 1, 8MP scores of 3 and anything higher would receive a 9. In the case of a qualitative parameter such as the Gyroscope, if such feature was present, the smartphone would receive maximum points, otherwise it would get the minimum. Each score that every smartphone receives in the relative category is then weighted, according to the importance of each category, as decided through the binary matrix. All the scores are then added; the smartphone with the highest score will result to be the one that is the most suitable for the mission purposes. However, as mentioned before, price plays a major role in the design decision, because of two main factors: smartphone price quickly drops once new generation models are introduced and the limitations of our overall budget for the project. A new parameter, diving the overall score by the price, was created, but it was not enough to tell the whole picture, since smartphone with very few features, but low price, were still scoring better than most phones. So we generated a plot, which can be seen below, of score vs price. Price is only considered for used smartphones, as for new ones it would be much higher, and a few models are labeled. 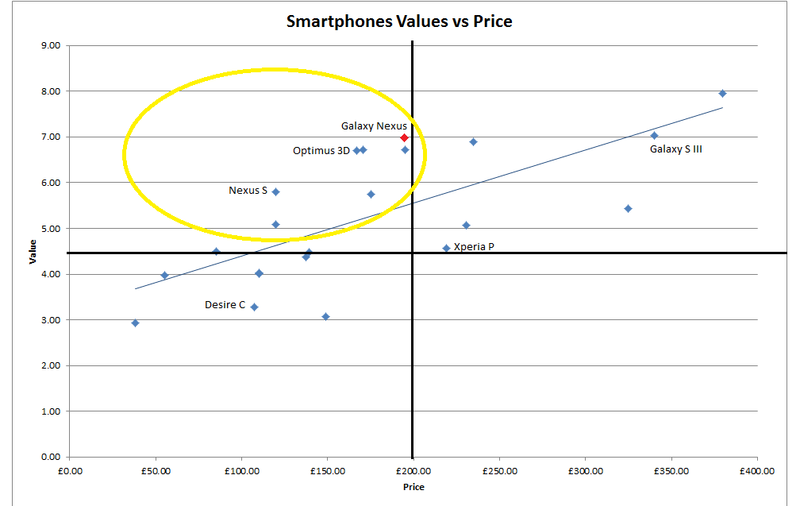 We then divided the plot into four quadrants, with the smartphones falling in the top left quadrant being the ones to choose from, as they would present a combination of good score and low price. The final choice was the Galaxy Nexus, which provides all the features we need, it has an impressive modularity, and it has an affordable price for the project. This article was posted in Technical Corner and tagged cubesat, design, engineering, mobile phone. Bookmark the permalink. Follow comments with the RSS feed for this post.Post a Comment or leave a trackback: Trackback URL.